This morning, Facebook reminded me that I shared this photo on my timeline a year ago today. This is the third quilt that I made after I took a beginner’s quilting class last year. I’d pulled the pink striped fabric and the green gingham print from my fabric stash, but it took me a few weeks of searching various fabric shops until I came across that perfect accompanying print of flowers against a yellow background. For the backing, I used a flannel print that I’d purchased around 2003-2004, when we’d just moved to Ventura. 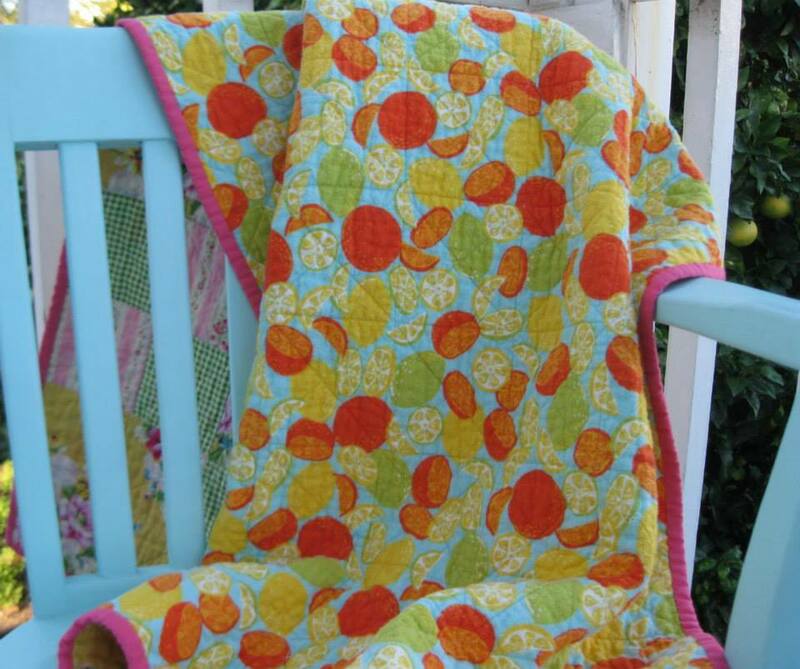 I love the color combination of this quilt, and the flannel backing is so soft and comfy. I use it all the time when I’m lounging on the couch. The only problem is that it’s not very large, so my feet stick out from underneath if I pull it up to my chin. I think about making another quilt with a flannel backing, but I’ve got so many other projects I’d like to complete. So many projects, so little time! I am glad to see among my fellow bloggers that this is a perfectly common feeling. Categories: Handmade | Tags: patchwork blocks, patchwork quilt, quilt, quilting | Permalink. Those fabrics work so well together. It is beautiful. Love this quilt! I am working on my first quilt, but I haven’t started stitching the layers together and also do not have a walking foot on my sewing machine. Did you use one and is the finish hand-stitched? (If so, how is it holding up after washes?) I am already a lazy quilter before I even finish one..